Revolutionary Alternative Force of the Common (FARC) Political party flags are seen during a protest in support of the Special Jurisdiction for Peace (JEP) in Bogota, Colombia, March 13, 2019. 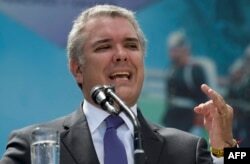 Colombia's lower house on Monday rejected President Ivan Duque's suggested changes to a special tribunal tasked with trying former rebels and military officials for war crimes, the latest in a series of congressional defeats for Duque. The changes had been widely expected to be defeated because the peace accord is now part of the country's constitution and changes to it require a two-thirds majority in the legislature. Duque's coalition has less than half of the seats in the lower house and a slender majority in the Senate. FILE - Colombian President Ivan Duque speaks during a ceremony for the recognition of command of the Military Forces at the Jose Maria Cordova Military School in Bogota, Dec. 17, 2018. He also objected to the suspension of investigations by ordinary authorities into cases submitted to the JEP and asked lawmakers to exclude sexual crimes from the tribunal's remit.